Forney Trade Days Hometown Market - New Location! 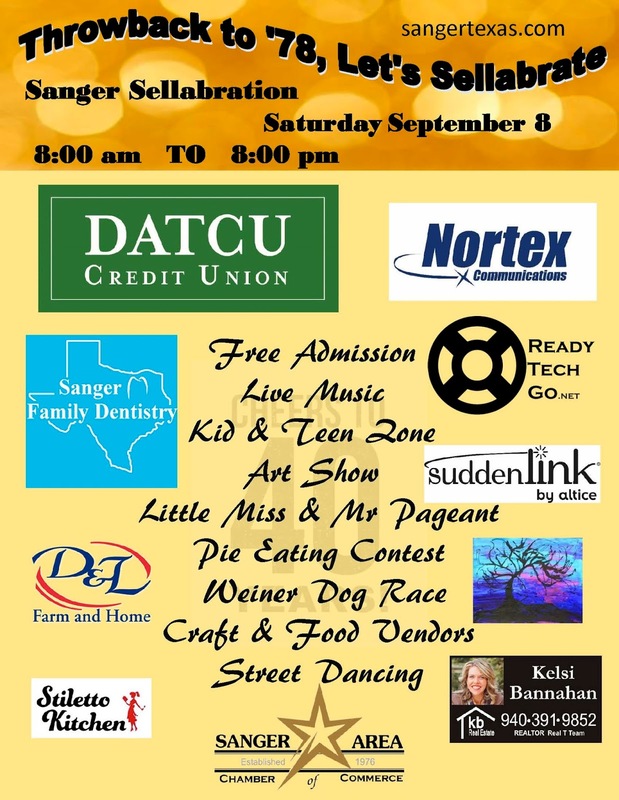 "Sanger’s Chamber of Commerce is hosting their 40th Annual Sellabration on Saturday, September 8, 2018 from 8:00 am to 8:00 pm, which is the highlight of the Sanger Community. Historically, over 5,000 people have attended this festival. The festivities include live music; vendors; kid & teen’s zone; numerous stage performances; Little Miss & Mr. Sanger Pageant; pie eating contest; art show; wiener dog race; street-dancing and a variety of festival foods all in a street-fair atmosphere. There is no entry fee and it is definitely family-friendly. 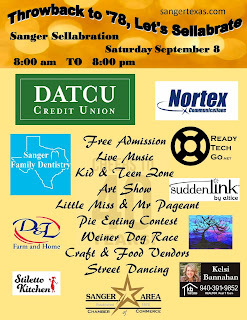 So come on out and join us in Historic Downtown Sanger located at Bolivar and 5th Streets." Free WiFi access. No tables, chairs, lunch. Electricity, water, food permits rates are listed with booth prices. Applications are available here and are due by August 31st, 2018. For more information, visit their website / facebook or contact their event coordinator at chamber@sangertexas.com / 940-458-7702.